I’ve realized that as long as I have good music or something to watch on TV, I can run for hours. Yeah, running on a treadmill. . not the best option, but the only option for me here in Wisconsin right now. No one told me the snow stays on the ground from the first big snow fall until March (sometimes April). Maybe people purposely do not disclose that for obvious reasons. But now I know. Anyway . . . good music, mindless, entertaining reality TV and my fave movies that I can watch over and over again, keep me going. Time to get back into a healthier routine. Time to start an exercise routine of some sort if you don’t do anything now. And it’s not about losing weight. It’s about being healthy, having energy and being your best self. Those endorphins you get while exercising are real my friends. They are very real. After I run, I’m usually famished. 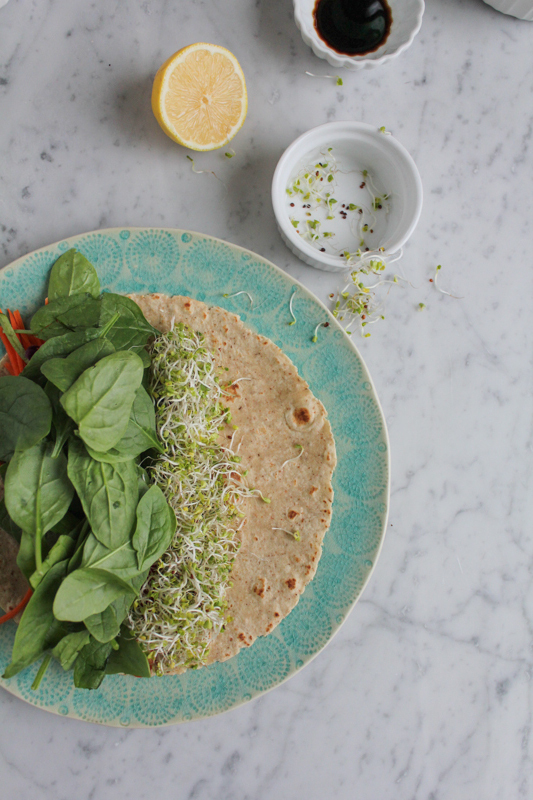 So instead of rewarding myself with a slice of chocolate cake, I’m kidding. . today, I’m making one of these power wraps. Packed with protein-rich tofu, a ton of raw veggies and my favorite Asian dressing, these are hella delicious and will give you nothing to feel guilty about. So, those 3-4 miles I just ran? I’m still burning those calories and feeling good. 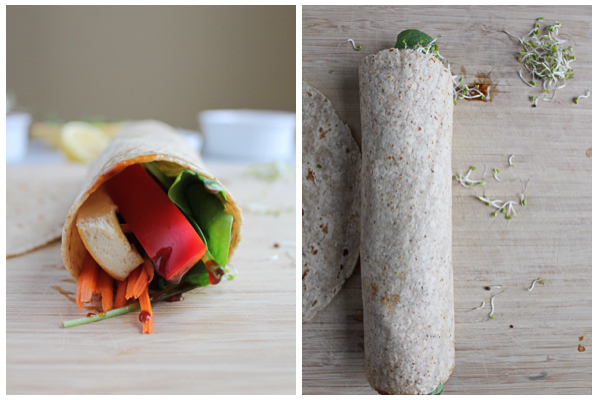 These wraps are super easy to make. 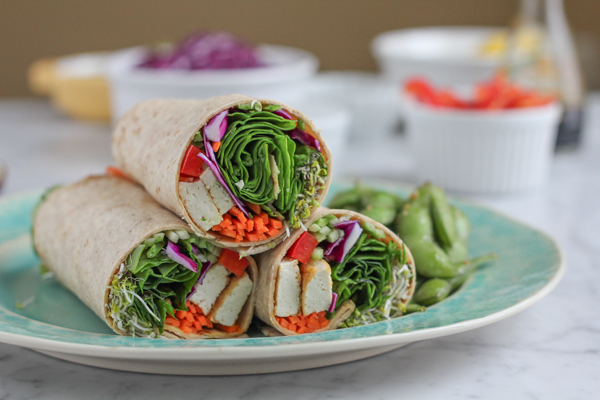 Just prep and slice all of your veggies (you can even do this the day before and leave them in your fridge), pan fry some tofu, slice and lay all of the ingredients into your whole wheat tortilla and roll it up, starting from one end to the other. Pack in as much, or as little as you want. I hope you give these a try! And if you are into eating healthier right now, smoothies and everything else. . come back here on Monday!! I’m giving away a 3-day Fresh Start Cleanse from Suja Juice (costs $162!)! Hope to see you back here on Monday! Have a great weekend everyone! I'm providing two other dressing options below this recipe card. For the tofu, if you're feeling really Asian, sprinkle some furikake on your tofu after you have pan fried. Using a small bowl, whisk together the hoisin sauce, honey and sesame oil. Taste and adjust ingredients as needed. Sprinkle on some sesame seeds and set aside. Using a large pan, heat the olive oil over medium-high heat. Add the tofu slices and cook on each side until nicely browned and crispy, for about 5 minutes on each side. Remove from pan and slice into strips. 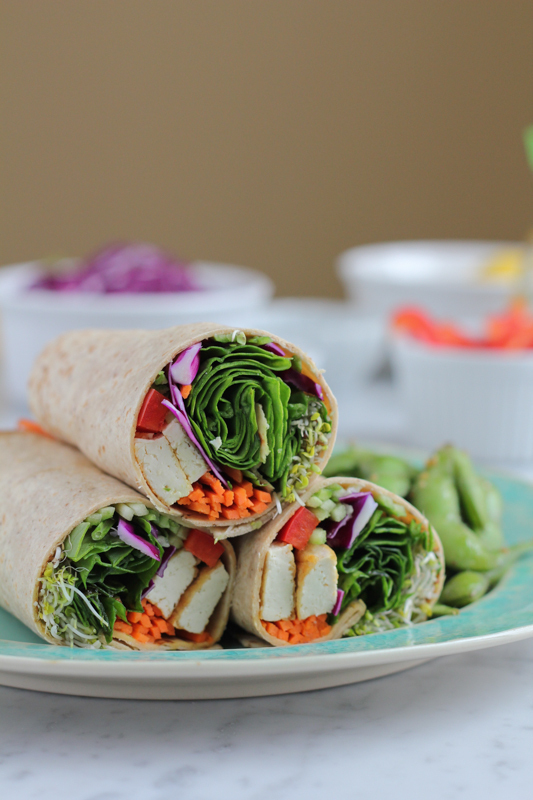 Working with your whole wheat tortilla on a clean, flat surface (you can also warm up your tortilla if preferred) lay in the tofu strips and all of the cut veggies, starting with the carrots, cucumbers, red bell pepper strips and red cabbage. Next, lay the spinach on top and add the alfalfa sprouts on the side. Add the dressing on top and roll the tortilla closed, starting from one end and rolling to the other end. Slice and serve with extra dressing on the side and sriracha sauce for a kick. For something spicier: 1/4 cup gochujang (Korean hot pepper paste), 1 tablespoon honey and 1 tablespoon sesame oil. Whisk together all of the ingredients, taste and adjust anything as needed. Sprinkle on some roasted sesame seeds and enjoy. For a miso option: 4 tablespoons low sodium soy sauce, 1 heaping tablespoon honey, ½ teaspoon miso paste, pinch of freshly grated ginger, 1 garlic clove minced. Whisk together all of the ingredients, taste and adjust anything as needed. Sprinkle on some roasted sesame seeds and enjoy. haha, I’ll do my best! 😛 Happy Friday!!! What a fantastic recovery meal after your runs! 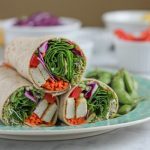 There is so much goodness in this wrap, and that hoisin dressing is the real kicker (I love everything hoisin)! Thank you so much, Dara!!! Trying to stay on track with you and Liz!! Healthy new year, woot woot!! These wraps look so fresh Alice! Awesome, healthy meal! Pinned! Alice – your pictures of this wrap are so gorgeous they completely distracted me from salivating over that chocolate cake you mentioned (yes, I am THAT person that starts drooling at the mere mention of chocolate)! This wrap is even better than a protein shake to me! Love the color and that dressing! I need to use you as my inspiration to running on a treadmill – I get so distracted and hop off and then hop back on – gah! I will be back on Monday to check out your giveaway of a 3-day Fresh Start Cleanse from Suja Juice! Hope you have a wonderful weekend! Stay Warm! It’s about “being your best self.” Well said – I’m tired of focusing on the weight loss and ready to just focus on being my very best, with energy so I can let my light shine in this world. And…my lunchtime eating habits are terrible – this would be a great way to nourish myself mid-day. I’ll let you know how it goes. I love, love, love tofu! 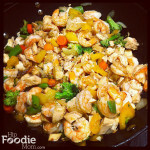 This dish looks and sounds delicious and the colors are gorgeous! I know that if I ever get into running, you will be the one I call for sure. I have tried and just can’t seem to get into it but maybe I need to try music. This looks like one power meal to keep you going for hours. Pinned. Totally agree, it’s all about being healthy and feeling your best. 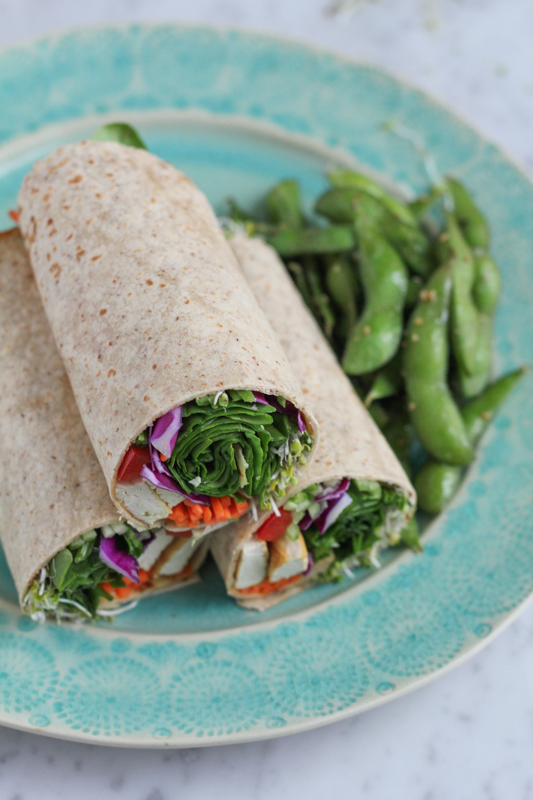 These wraps look perfect for fueling up after a workout. Love the tofu and all the veggies you packed in here! All three dressing options you gave sound amazing! hahah no one tells you for a reason. Did I tell you I got recruited to attend college in MN and no one told me it snowed? All the pictures they showed me were summer and beautiful. And then I got there and I was like WHOA! It’s like cold from November to April! Anyway this wrap looks amazing!! Thanks for the extra dressing options too. I have leftover Korean hot paste and was wondering what to do with it! Yep, time to get back on track! The start of a new year is always a great reminder. And these, wraps. Alice, they not only look delicious but the way you wrapped them is a work of art! That’s one beautiful wrap, Alice! Love the colors. I’m not a huge tofu eater. I buy a container, use a little for the recipe, and the rest goes bad. I should probably gather a few tofu recipes before I buy it. That list starts with this wrap. Haha, I am the total opposite. I HATE running with such a passion… unless I’m chasing something, like a ball, and it distracts me from what is actually happening. Lol. 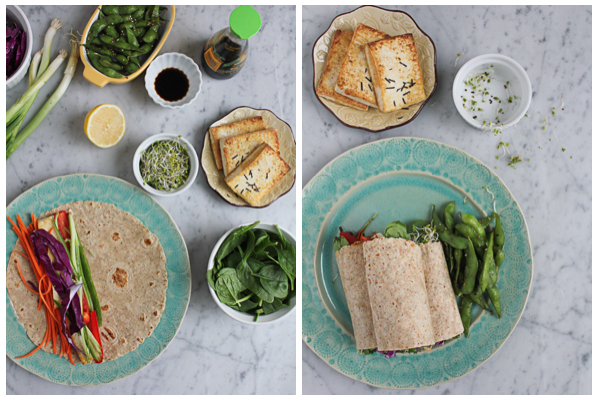 These wraps are perfect for recovering from holiday sugar comas! 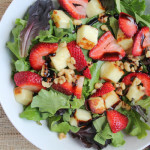 Not only is this healthy and delicious it’s also GORGEOUS!!! Oh my! This is so my kind of lunch! 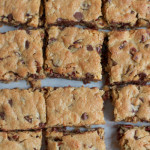 I’m all over this recipe! Pinned! These wraps look so fresh and delicious, I love all the color. 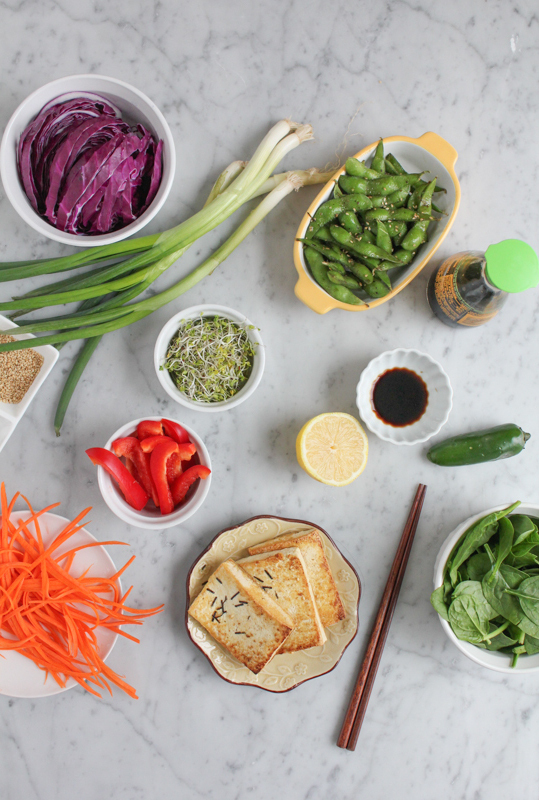 Eating healthy has never looked better! I am so on the same page as you on running, love it. When I START running to great music I think I can go forever…then 2 songs later (yes, 2) I’m always like I’m gonna diiiee. Love these colorful wraps Alice! Nothing like bright veggies to warm a snowy day. Pinned! These are beautiful wraps, and photos!! LOVE this. Would love to see it on FindingVegan.com! Alice, you just make healthy eating COOL. I love that Miso sauce option! And no way do my wraps look as perfect as yours do when I cut them! I’ve never thought to use tofu in a wrap, Alice! I love this idea! 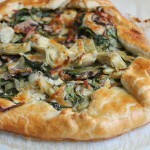 Especially when combined with the spinach, sounds like the perfect lunch! Pinned! This wrap is absolutely gorgeous and I know it will taste as good as it looks! I (finally!) got back on my elliptical after all the holiday dust has settled, and it felt so good! Those endorphins are no joke 😉 And the last thing I want to do after that is ruin all my hard work with an unhealthy meal. 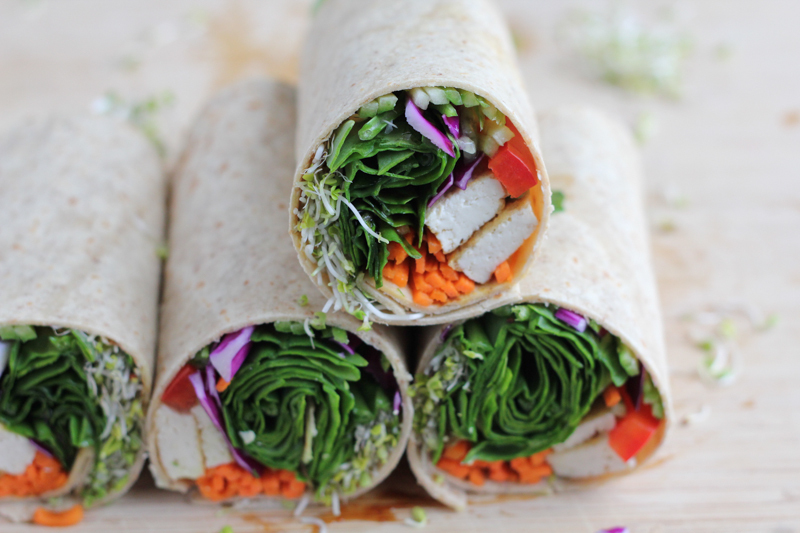 These wraps are perfect, and that dressing sounds amazing! Oh how I wish I could get into running. I’ve tried numerous times but I just really hate it. LOL. Now give me a stair machine and I’ll stay on it for 45 minutes. LOVE those things. So since I don’t go to a gym and I don’t have however many thousands of dollars a nice stair machine costs, I go out walking and I’ve been doing weights and toning exercises at my house. Feeling better already and trying to make it not just be a phase this time! 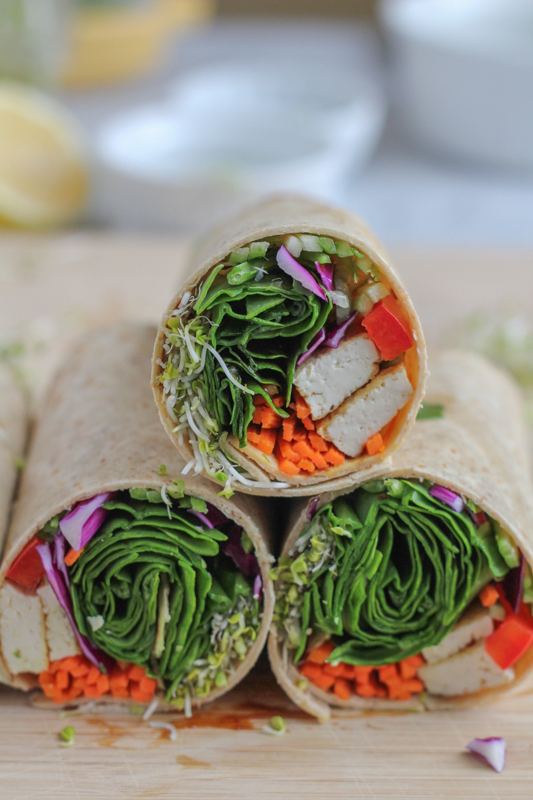 Totally digging these healthy wraps, Alice! 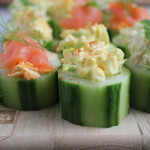 I need to make some of these for lunches during the week! Yes, I decided I definitely have to step up my game in the fitness department. These rolls are my kind of food, Alice! Love the vibrant colors and browning the tofu first (with a liberal sprinkling of furikake for me) makes it double delish! Haha that’s kinda a rude awakening in the snow-department! Yep, once that first snow hits we can say buh-bye to anything green until at least the end of March. LOL. Oh, gosh. And these wraps. Could there ever be a more perfect power lunch in the history of lunches? I love all the GREEN healthy stuff! Pinned! Yum! 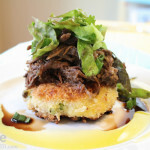 This totally works for my MeatlessMonday and send me some snow, please…. I was just trying to decide what to do with the tofu in my fridge. This wrap is exactly the right answer! PS – I can’t run. Endorphins are totally real!!! I’ll have to try this easy wrap after one of my workouts! It looks delicious! Pinned! I love anything with tofu, Alice, and these look phenomenal! Can we do it the day before we eat it? 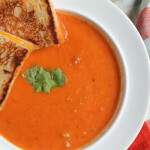 Like for lunch? Hi! Yes, but I would keep the dressing separate so the tortilla doesn’t get soggy.